This 128 page book teaches natural ways to lose weight, lower your blood pressure, and increase your energy without pain, pills, physicians, or prescriptions. This book on health is written from a Biblical perspective as well as research from twenty-nine other sources. Those who are applying this information are enjoying great success in losing weight, lowering their blood pressure without medication, and increasing their energy. 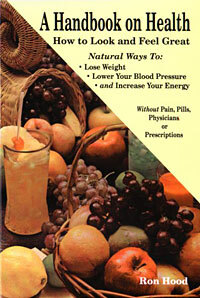 The book also discusses how you can avoid sickness and disease and save thousands of dollars on medical expenses. What Is In It For Me—Why Should I Read This Book? You will learn how to lose weight naturally—without diet, doctors, pills, or pain. You will learn how you can lower your blood pressure naturally and safely without medication. You can feel better and have a lot more energy. You will look better and feel much better about yourself. You will learn how different foods affect you mentally, emotionally, and physically. You will learn how your body cleanses itself. You will learn how to avoid sickness and disease. You will develop the confidence to accept responsibility for your own health. You can save thousands of dollars on medicine and medical expenses. You will learn the benefits of exercise. You will probably live longer, feel better, and enjoy life a lot more. Thanks so much for the health books. I really was asleep to my body's needs. Thank the good Lord for directing you all to write it. I've followed it and was 248 lbs. to date. I'm 217 lbs and still trying to lose more. (In 16 days he lost 31 lbs.). Please send me three more books and a set of Scripture cards. Thanks again for the wake up call. Thank you, In Christ, John and Barb Freach (Paradise Valley, Pennsylvania)"
John Freach was 71 yrs. old at the time he wrote this testimony. He called me Tuesday, Dec. 5, he had just finished reading my book, and he had some questions especially about how to lose weight. He was about 70 lbs. overweight. He started Dec. 7 by eating raw fruits and vegetables for ten days. Then he went six days on juices. During this sixteen days, he lost 31 lbs. He went from 248 to 217. When he started the diet, he could only walk 2 min. on treadmill without chest pains. Sixteen days later, he could walk on the treadmill for 15 min. with no pain or shortness of breath. His arthritis disappeared so he stopped taking his arthritis medicine. He also discontinued his muscle relaxing medicine. He is taking metropholbl for the heart. He told me in a letter of January 3, "I started reading your Handbook On Health and couldn't put it down. I was 248 approximately Dec. 4. Thanks for the books and Scripture memory in booklets and phone calls."